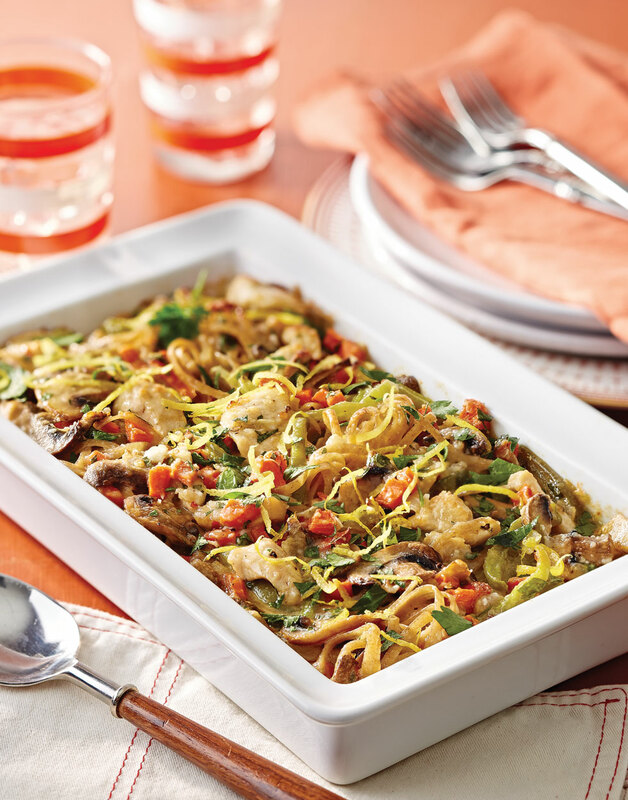 For a healthy tweak on a rich and creamy casserole, try this wholesome tetrazzini with whole-wheat linguine, boneless, skinless chicken breast, and a plethora of vegetables. Preheat oven to 375°. Coat a 1½-qt. baking dish with nonstick spray. Cook pasta in a pot of boiling unsalted water until nearly al dente, about 6 minutes; drain. Sauté chicken in 1 Tbsp. oil in a sauté pan over medium-high heat, 5 minutes; transfer to a paper-towel-lined plate. Add mushrooms; sauté until liquid evaporates, about 5 minutes. Add remaining 1 Tbsp. oil to pan; sauté carrots, bell peppers, onion, and garlic until carrots soften, 4 minutes. Stir in flour; cook 1 minute. Add milk and broth; cook, stirring constantly, until sauce thickens, about 2 minutes. Reduce heat to low. Stir in Parmesan, pepper flakes, salt, and black pepper until Parmesan melts. Stir in sherry, chicken, pasta, and 2 Tbsp. parsley; transfer to prepared dish. Bake tetrazzini until bubbly, 15 minutes; let cool 5 minutes, then top with remaining 2 Tbsp. parsley and zest. To keep the pasta from becoming mushy, since it will also be baked, cook until it’s not quite al dente. Bump up the meat flavor in this veggie-centric casserole by adding chicken broth to the creamy sauce.